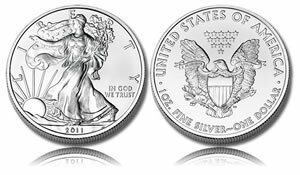 The United States Mint sold fewer of its American Silver Eagle bullion coins in July 2011 than the previous month or from the same time a year ago. Although sales slowed for the .999 fine silver coins, the month ranked in the top fifteen of all-time and it was the second best ever July. Additionally, the sales pace remains on track for the all-time high annual record. The United States Mint in July delivered 2,968,000 Silver Eagle bullion coins to its network of distributors. That was down 12.8 percent from June 2011 and 0.4 percent lower than July 2010 which retains the number one spot as the best ever July. The Silver Eagle series was introduced by the Mint in 1986. Historically, summer months and July in particular have been weaker for bullion coins. 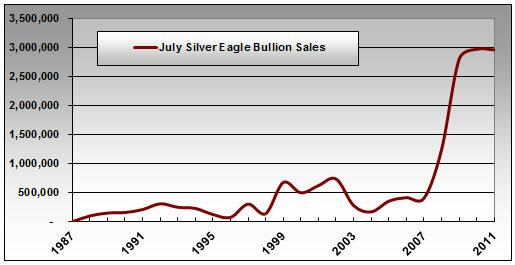 In fact, prior to the economic uncertainties that began making waves for the Silver Eagle in late 2007, typical July sales levels were lucky to reach several hundred thousand. July also registered as a top month of all time for the Eagle, ranking as the 14th best month. Sales, as mentioned, remain on pace to break the all-time annual record. That record was set just last year when 34,662,500 were sold. Current year-to-date sales stand at 25,271,500. For 2011 to take the title, the Mint needs to sell an average of 1,878,200 Eagles for each of the remaining five months of this year. As a perspective, the slowest Silver Eagle month of this year was in March at 2,767,000 in sales. The Silver Eagle bullion coin is intended for investors, although coin collectors will purchase them as well for their collections. The collector version of the 2011 American Silver Eagle, shown in this United States Mint image, has a special proof or mirror-like finish and a West Point ‘W’ mintmark denoting its production in West Point, N.Y. The bullion version is intended for investors and does not have these two characteristics. 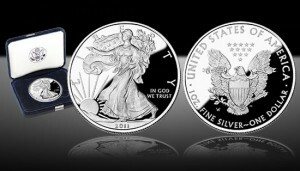 The collector version, the 2011 Proof American Silver Eagle, made its first appearance on June 30. This coin, which carries the numismatic proof finish and features a mintmark — both traits missing from the bullion Eagle, certainly had some effect on bullion coin sales. The latest United States Mint sales figures indicate 621,983 of them were purchased between June 30 and August 1. Had the coins been unavailable, buyers would have certainly shifted some of their focus and money towards the bullion version. The proofs were also sold last year but the 2010-dated issue was only released on November 19.